SessionCam is a website analytics and conversion optimization tool that uncovers and prioritizes valuable insights in your customers’ online behaviour. For the purposes of the Data Protection Act 1998, the General Data Protection Regulations and any other applicable data protection and privacy laws and regulations (“Data Protection Legislation”), SessionCam will be the ‘data controller’ for all personal information we determine the means and purpose of processing and has registered with the Information Commissioners Office under registration number ZA115103. If you are a visitor of a website using SessionCam services (“SessionCam Client”), we will be the ‘data processor’ for the SessionCam Client. If you wish to discover how your data is handled under Data Protection Legislation, please refer to the privacy notice belonging to the SessionCam Client. The ‘Information we collect for our clients’ section below provides further information regarding the services we provide as a data processor. As part of the account registration process, we will collect the information required to set up a SessionCam account including your name, email address and the website on which you wish to use our service. We may also collect credit/debit card payment information from clients purchasing a SessionCam subscription directly via our website. We use Recurly for our subscription management and Paypal for our payment processing. No credit/debit card information will be stored directly by SessionCam. We may collect additional information you volunteer to us when calling our support staff regarding any elements of the service. We will only retain the personal information pertinent to delivering your services. If you have opted in via our website to receive a product demonstration, free trial or marketing communications from us, we will handle your personal information (including: your name, email address, postal address, telephone number and the website you wish to use our services on) to provide you with marketing communications in line with any preferences you have told us about or for servicing your free trial. The information we request on our contact, product demonstration or free trial forms is processed specifically to provide you with the services you have requested or respond to your enquiry appropriately. From time to time, we may invite visitors to participate in a web-based survey. We will always state the purpose of each of these surveys. In addition to any information you provide to us completing the individual surveys, we may also request your name, email address telephone number. Participation is entirely optional and any information we collect is only used to improve the products and services we offer to our clients. We process the information collected from the surveys with your feedback and you have the right to withdraw this consent and stop our processing of this information at any time. If you wish to withdraw your consent, please email privacy@sessioncam.com. When you email us, we may also handle your personal information (your name, contact details and the other details you provide to us during the call) in order to service your enquiry or provide the customer services you have asked us to perform. You always reserve the right to withhold your personal information, but this may affect how we provide our services. We will only process your information for as long as we have a relevant legal basis to do so. This is usually in order to provide you with the services you have requested from SessionCam and unless stated, all of the above processing is conducted under the legal basis of performance of a contract. We will only use your Personal Information for the purposes for which we collected it, unless we reasonably consider that we need to use it for another reason and that reason is compatible with the original purpose. If we consider the new purpose to be incompatible with the original purpose of collection, we will conduct a Privacy Impact Assessment or contact you to request your consent for further processing. If you wish to get an explanation as to how the processing for the new purpose is compatible with the original purpose, please contact us at privacy@sessioncam.com and we will direct your request to our Data Protection officer. SessionCam uses a cookie to store details of the last time you were invited to participate in one of our surveys. SessionCam also uses a cookie to identify return visits to our website by regular users. This information is used to understand the differences in use between a new user and a returning user. SessionCam Various Performance These cookies are used to collect information about how visitors use our site. We use the information to compile reports and to help us improve the site. The cookies collect information in an anonymous form, including the number of visitors to the site, where visitors have come to the site from and the pages they visited. SessionCam is committed to ensuring that data is stored, archived or disposed of in a safe and secure manner. We have procedures in place to try and prevent any unauthorised access or disclosures and to safeguard and keep secure the information that we collect. We use computer safeguards such as firewalls and data encryption, we enforce physical access controls to our buildings and files, and we authorise access to personal information only for those employees who require it to fulfil their job responsibilities. SessionCam is accredited with the ISO27001 Information Security Management Standard. To ensure we continue to monitor our obligations under Data Protection Legislation and comply accordingly, SessionCam has appointed a Data Protection Officer who coordinates all matters of data protection across the entire organisation and can be contacted by emailing privacy@sessioncam.com. SessionCam uses an AWS hosting system based in the US-East territory. The transfer of this personal information is governed by the EU-US Privacy Shield Certification which provides an adequate safeguard for the transfer of personal information to a third country outside of the EU. If and when we share your data, we always do so under a written agreement governing how your data must be protected. we may use carefully selected sub-processors to help us collect, store or manage your information. This will always be managed under the terms of a written data processing agreement. if SessionCam is acquired by a third party, in which case Personal Information held by it about its customers will be one of the transferred assets. We process your Personal Information for this purpose because we have a legitimate interest to ensure our business can be continued by the buyer. If you object to our use of your Personal Information in this way, the relevant seller or buyer of our business may not be able to provide services to you. To determine the appropriate retention period for Personal Information, we consider the amount, nature, and sensitivity of the Personal Information, the potential risk of harm from unauthorised use or disclosure of your Personal Information, the purposes for which we process your Personal Information and whether we can achieve those purposes through other means, and the applicable legal . You can exercise the following rights to your data by contacting us at privacy@sessioncam.com. SessionCam is a website analytics and conversion optimization tool that enables our clients to gather details of how their customers use their . We do not permit the recording of PCI data by our clients. Any data recorded by SessionCam on behalf of our clients is recorded exclusively for their own use. We do not sell, share or use the data recorded for clients by SessionCam ourselves or with any other third-party organisation. All of the information collected by SessionCam for our clients is encrypted using AES-256 at the point of recording. The information collected is stored and managed within our secure infrastructure which includes physical, hardware and software-based security controls. Access to the information we collect is carefully controlled and restricted to authorized individuals only. Our clients have access to the information collected from their customers only via SessionCam. Client access to the data gathered by SessionCam is restricted to defined, individual user accounts through our web-based reporting console, which is under 256-bit SSL encryption. 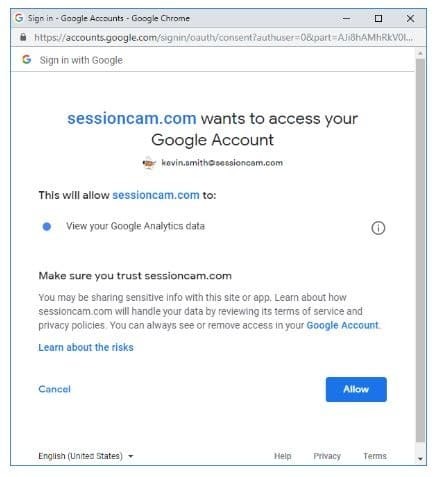 SessionCam offers customers the ability to link their Google Analytics accounts to SessionCam in order to allow SessionCam recordings to be filtered by Segments defined within Google Analytics. As part of the setup process for this, you will be asked to authenticate with your Google account. This allows SessionCam read-only access to your Google Analytics data. More information on this can be found here. We store this list of SessionCam ID’s and match these to SessionCam recordings. Please check this notice from time to time to ensure you are aware of any updates we may have made to our Personal Information handling practices. The date of the changes will be listed in the ‘Last updated’ section below. We will endeavour to notify all of our current clients of any updates to this notice via email and we will post the relevant announcement on our website homepage. Please contact us at privacy@sessioncam.com if you have any questions, comments or requests regarding this Privacy Notice.